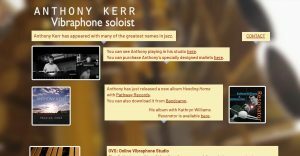 Following on the success of our website for tenor saxophonist Alan Skidmore, we have just designed a website for the vibraphone ace Anthony Kerr. We have included two video clips of Anthony playing Billy Strayhorn’s Isfahan and George Gershwin’s Summertime which we filmed specially for the website and his YouTube channel. Anthony is a renowned soloist who has played regularly with the BBC Big Band, Georgie Fame and the New Blue Flames, Charlie Watts and many other leading musicians around the world. He is also professor of vibraphone and jazz improvisation at the Royal College of Music in London. He also provides bespoke music tracks and tuition from his fully equipped studio. There are links to allow visitors to purchase his latest albums and his branded vibraphone mallets.